The Four-Minute Make-Up Challenge & The Tres Chic Style Anniversary Give-Away of the Day"
As a busy fashionista and mommy to two of the sweetest lil' cupcakes in town. My morning usually begins with a 5 minute re-cap of the morning news, blogging, preparing breakfast , packing lunches, listening out for the school bus and a few extra minutes for make-up basics. Concealer (60 seconds)- Concealer may be just the trick you tired eyes need in the mornings. Dot a little under your eyes with a pat of your finger. It'll hide your dark circles and works great when there's little time for a complete foundation application. Tinted Moisturizer (90 seconds)- This provides a sheer veil of color that helps to hide imperfections while offering a subtle glow and dash of moisture that provides a dewy look. Mascara (45 seconds)- Hands down this a beauty must-have. Start applying at the base and use upward strokes. If you can spare an extra 30 seconds, grab a lash curler and clamp down & hold for 30 seconds. Blush (30 seconds)- Sweep on your favorite hue and pay close attention to those cheekbones! 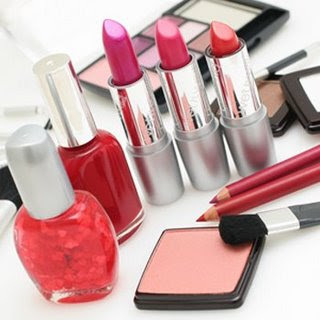 Lip gloss (15 seconds)- This last-minute step needs no mirror to apply..... Tinted lip gloss adds a hint of color fast, effortlessly and looks fabulous! As promised we'll be giving away a special gift each day beginning October 1, 208 and ending on October 8, 2008. Email your name and contact info (email): treschicstyle@gmail.com to be entered into the contest. Emails must be forwarded no later than, October 8, 2008 12 midnight (EST). One winner will be selected each day during a random drawing and will be notified via e-mail to receive the prize. 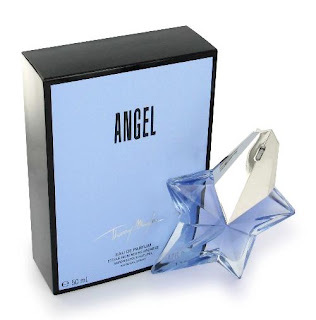 Angel is the first perfume by Thierry Mugler, it evokes the emotion of tender childhood memories together with a sense of dreamlike infinity.